MagTek MiniWedge Stripe Reader - Track 2, Keyboard wedge interface. Includes PS/2 Y-cable. Color: black. Powered by the keyboard port--no external power supply required. 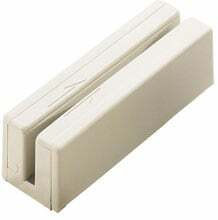 The MiniWedge Stripe Reader reads information from tracks 1, 2, and/or 3, comes with a Keyboard wedge interface (PS/2 or AT), and is available in black or white finish. The MagTek 21080206 is also known as Mag-Tek	MAG-21080206	.